Gibson County police have taken three people into custody, with two facing drug charges, following a pursuit that stretched multiple counties. On November 7th at 12:14PM, Gibson County Central Dispatch received a report of a disturbance in the area of East State Street and Washington Street in Princeton. Upon arrival, police attempted to stop a car in the area driven by 46-year-old Jeffrey Siekman. Siekman fled and led authorities on a cross county pursuit. The chase ended after Siekman left his car and fled to a home located in the 1200 block of east 11 South. Siekman was located and taken into custody, police continued their investigation by speaking with the residents at the home. 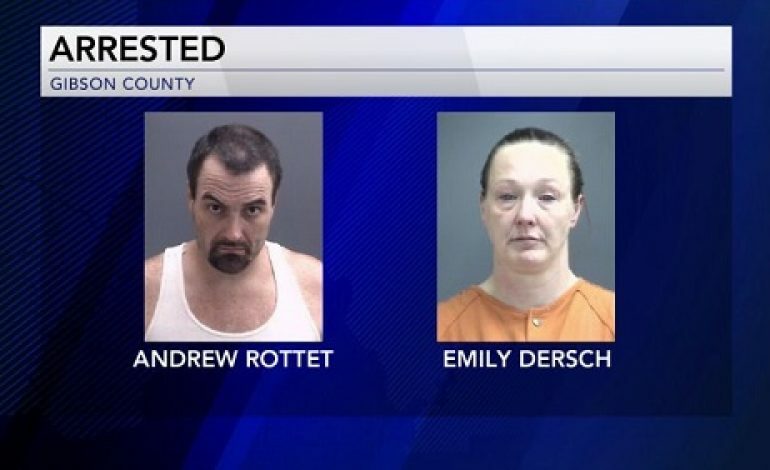 Police say they found illegal drugs at the residence and arrested the homeowners, 41-year-old Andrew Rottet and 37-year-old Emily Dersch. Rottet was charged with dealing in marijuana, possession of marijuana, possession of paraphernalia, and possession of methamphetamines. Dersch is facing charges of possession of methamphetamines, possession of paraphernalia, and possession of marijuana. Both have since posted a $750 bond. Charges against Siekman are pending at this time.